Over the past several decades, multiple disputes over historical monuments and the symbolism they carry have broken out across the post-Soviet region. Notably, Russia has vocally denounced the removal of any monument to “liberating Soviet soldiers” in other former Soviet states—most famously in Estonia and the other Baltic countries. But the erection of new monuments has also generated disputes between some of the closest partners in the former Soviet space. In 2012, for instance, Moscow condemned the raising of a memorial in Astana to 1.5 million victims of Joseph Stalin’s forced collectivization; and in 2014, Russia expressed anger when Armenia erected a monument to Garegin Nzhdeh, whom the Russian government considers a Nazi collaborator (Azatutyun.am, June 11, 2016). In the latest such case, a rare dispute has ignited between Azerbaijan and Georgia, two strategic partners in the South Caucasus, over the erection of a bust of Mikhail Avagyan. The individual being memorialized is an Armenian combatant who fought in the Nagorno-Karabakh War, and his bust was initiated and financed by an ethnic-Armenian businessman. 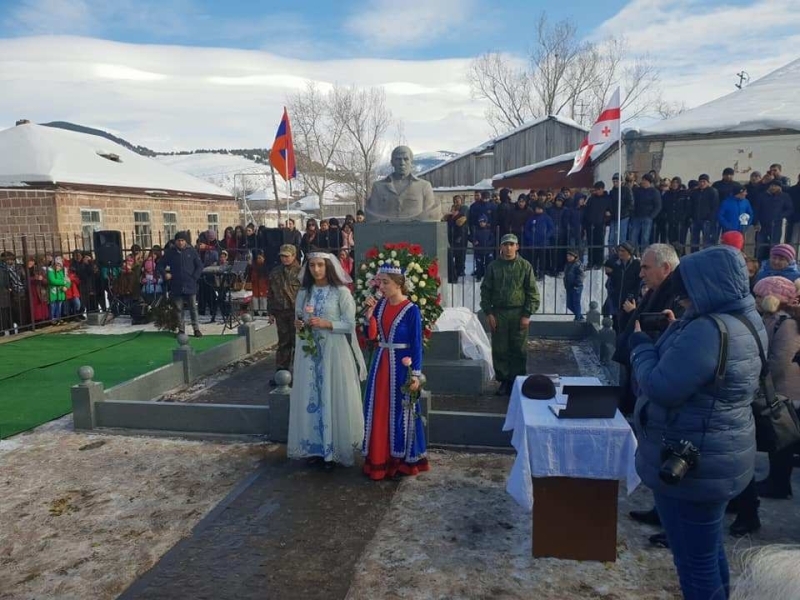 On January 20, 2019, the statue was ceremoniously unveiled in the village of Bughasheni, south-central Georgia. In attendance were the mayor of nearby Akhalkalaki, Yurik Hunanyan; Armenian Ambassador Ruben Sadoyan; as well as two ethnic-Armenian members of parliament (MP) from the ruling Georgian Dream party, Enzel Mkoyan and Samvel Manukyan (Azernews.com, January 26). While few noticed this event in Georgia, it immediately became big news in Azerbaijan, drawing negative reactions from officials and MPs, as well as being widely discussed in the social media. Avagyan himself was a native of Bughasheni. The village is a suburb of Akhalkalaki, part of the Georgian region of Javkheti, which is predominantly populated by ethnic Armenians. He later moved to Armenia, volunteered to participate in the Nagorno-Karabakh War against Azerbaijan and was mortally wounded in combat operations in 1994. He fought in Horadiz, Hadrut, and Fizuli, as well as Khojaly, where more than 600 Azerbaijani civilians were massacred by Armenian forces (Ekho Kafkaza, January 25). While cutting the red ribbon, The Armenian ambassador, said, “Thanks to such brave patriots as Mikhail Avagyan, our people managed to win important victories” (Azeritimes, January 24). After his death, Avagyan became a hero for Armenians, while remaining almost totally unknown to most Azerbaijanis and Georgians. But now he is at the center of media attention in all three South Caucasus countries. Armenians call him a hero, but Azerbaijanis consider him a murderer of civilians and demand the removal of his statue. Whereas, Georgia has found itself in a dilemma to come up with a solution that will keep from irritating its large ethnic-Armenian community while, at the same time, satisfying its even larger Azerbaijani minority as well as Tbilisi’s key strategic regional partner, Baku. It is also worth mentioning that the ceremonial unveiling of the bust of Avagyan occurred on the day of “Black January,” which, in Azerbaijan, marks the killing of hundreds of demonstrators in Baku by Soviet troops in 1990. This further angered Azerbaijanis. Moreover, the bust was unveiled just a few days after Azerbaijani and Armenian foreign ministers “agreed to take concrete measures to prepare the populations for peace” (Tert.am, January 17). Georgia’s ambassador to Azerbaijan, Zurab Pataradze, was immediately summoned to the foreign ministry in Baku in order to urge Tbilisi “to take urgent measures to remove the statue, which does not meet the spirit of bilateral strategic relations,” said foreign ministry spokesperson Leyla Abdullayeva (Modern.az, January 24). The Georgian government’s reaction so far has been indirect and ambiguous, reflecting the dilemma Tbilisi faces about what to do in this delicate situation. Officials from both the Ministry of Foreign Affairs and the parliament have mostly limited their response to repeating that Azerbaijan remains Georgia’s strategic partner and that no subject is off limits for bilateral discussion (EurasiaNet, January 29). In fact, Georgia’s cautiousness when it comes to its Armenian community is quite understandable. Armenians constitute 4.5 percent of the country’s population of 3.7 million—the third-largest largest ethnic community in the country after Georgians (86.8 percent) and Azerbaijanis (6.5 percent) (Census.ge, April 28, 2016). Interestingly, Armenians have also become the second-largest ethnic group in the breakaway Georgian territory of Abkhazia (Unpo.org, February 16, 2015), following the expulsions of ethnic Georgians from there during the 1992–1993 and 2008 wars. However, more importantly than its size, Georgia’s Armenian minority is also quite active politically. It has periodically demanded more autonomy and self-governance in Javakheti, thus making this area one of the most troublesome regions for Georgia’s central authorities in recent years (EurasiaNet, April 9, 2014; see EDM, May 24, 2005). The other side of the story is the reaction of the Azerbaijani community in Georgia. Although more numerous, Georgia’s ethnic Azerbaijanis are much less active politically and are less integrated into wider Georgian society. That said, openness in Georgian politics since the 2003 “Rose Revolution” has gradually empowered the Azerbaijani minority and encouraged it to become more organized and vocal. In the last national elections (2016), and for the first time since Georgia regained its independence, Georgian Azerbaijanis managed to elect the same number of deputies to the parliament as Armenians—representatives of both ethnic groups now hold three seats each. Ali Babayev, the chairperson of the National Congress of Georgian Azerbaijanis, stated that the local Azerbaijani community strongly condemns the monument to Mikhail Avagyan and called it a provocation that will damage relations between Georgia and Azerbaijan (Report.az, January 25). For now, Tbilisi’s position seems to be to “wait and see” until tempers calm down around the problem, and then decide what to do with this newfound headache. However, the situation once again demonstrates how deeply rooted are the conflicts in the South Caucasus and how sensitive and fragile the inter-ethnic situation is across the region.